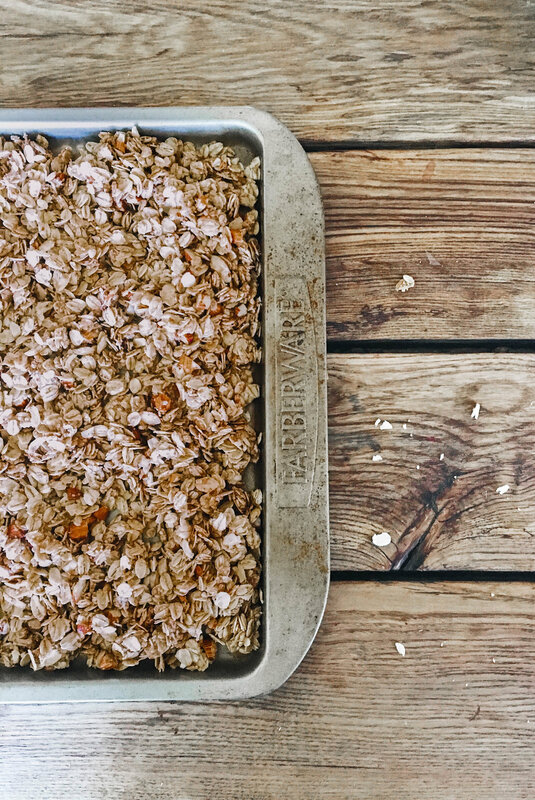 Fresh granola is a staple in our household. With the smell of toasted coconut and macadamia nuts filling the kitchen, its hard not to make it every week, not to mention it fuels our smoothie bowl addiction. Combine all dry ingredients in mixing bowl. Add wet ingredients to separate bowl and mix until combined. Add wet ingredients to dry until evenly incorporated. Spread mixture on baking sheet and bake at 350 until golden brown, approximately 30 minutes. Stir occasionally to allow granola to evenly brown. Once golden taken out of oven and stir mixture around and allow to cool. Serve over your favourite yogurt or smoothie bowl and top with fresh fruit.